Coupon Description: The Speidel 32 gallon stainless steel jacketed conical homebrewing fermenter is a professional grade jacketed fermenter made in Germany by Speidel. Speidel is a 5th generation family owned manufacturer of professional beer fermenters that offers a 25 year warranty on materials and craftsmanship. This conical fermenter is the very best out there. The stainless conical fermenter is built from 304 stainless steel with a 60 degree cone for harvesting yeast. Convenient top hatch makes cleaning and adding hops or oak easy. Heavy duty sealing mechanism and thick gasket ensure an air tight seal. The tanks will support a few p.s.i. of pressure, however they are not pressure rated or designed to be used under pressure. The inside is finished to Speidel quality standards. Bottom drain and racking port fittings are 1.5″ Tri-Clamp. Today only, you can save $250 on one of these speidel stainless steel conical fermenters. Coupon Description: Right now MoreBeer has these on sale for $6,395. These heavy duty stainless steel beer tanks are built for longevity, quality, and cost effectiveness. They also includes a hefty list of quality features to ease the brewing process. This 5 BBL Conical Fermenter is built from high quality 304 grade stainless steel and are covered with a dimpled jacket that allows for easy integration with a new or an existing glycol system,. They are then covered in another layer of polyurethane insulation foam and another sheet of stainless steel to minimize heat transfer. 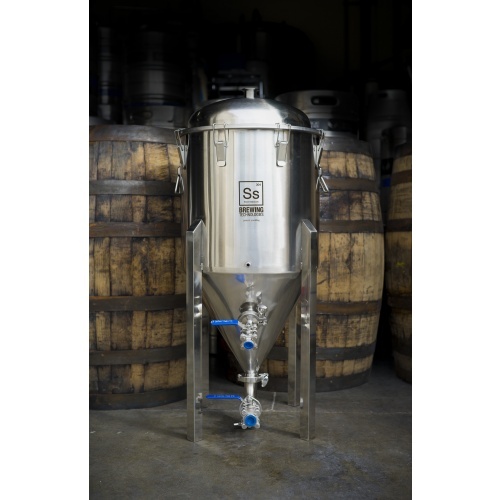 Here are some of the features of this beautiful 5 bbl stainless steel beer fermenter. MoreBeer Temperature Controlled Conical Fermenter Sale! 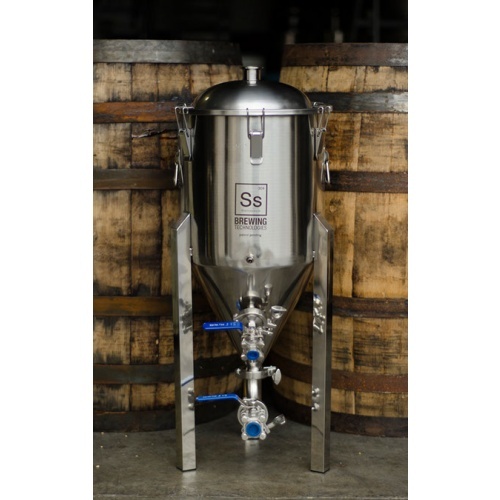 Coupon Description: Today only and while supplies last you can save $450 on a MoreBeer.com Stainless Steel Temperature Controlled Conical Fermenter! Best of all, they ship free! Coupon Description: Homebrew Supply has a fantastic promo code that can save you up to $45 on Blichmann home brewing purchase and SS BrewTech kettles and fermenters. For a limited time you can get a $20, $30 or even a $45 giftcard when you purchase a Blichmann or SS BrewTech item! This can save you a bundle on homebrewing equipment from two of the best homebrew stainless steel equipment manufactures out there. So if you have been thinking of buying some new kettles or a new fermenter, this is a great time! New Homebrewing Item Release Description: New home brewing items only hit the market every so often, but this is a big one and unfortunately an expensive one. That being said, it is a great option for large scale home brewers with some extra money in their pockets. Introducing the Speidel 31 Gallon – 1 Barrel, stainless steel jacketed conical homebrewing fermenter. This is a professional quality jacketed stainless fermenter that is made in Germany by Speidel home brewing. Some background on Speidel, they are a 5th generation family owned, manufacturer of professional quality beer brewing fermenters and brewing equipment. This brand new jacketed homebrew conical is made from 304 stainless steel with an featured a 60 degree cone for harvesting yeast and trub collection. It has a large top hatch that makes cleaning and adding hops or oak a simple task. The inside is finished to Speidel quality standards with a high polish and the bottom drain and racking port fittings are 1.5″ Tri-Clamp for easy cleaning, transfers and a sanitary environment. Warranty: Speidel backs up the stainless steel conicals with a 25 year warranty against defects in materials or workmanship. Coupon Code Description: MoreBeer makes the very best conical fermenters available to home brewers and right now they have a sale going on them. If you act now, you can save up to 30% on these stainless steel deluxe homebrewing conical fermenters. The sale is active on their 7 Gallon, 14 Gallon and 27 Gallon stainless conicals. So if you have been looking to pull the trigger on an upgrade homebrew fermenter, this is a great time. Best Price for Homebrewing Conical Fermenters! Coupon Description: MoreBeer.com currently has a coupon code that will get you 25% Off a Deluxe MoreBeer 27 Gallon Stainless Steel Conical Fermenter. These home brewing stainless conical fermenters are perhaps the best homebrewing fermenters available. Best of all, they are built right here in the United States and fabricated in the MoreBeer metal shop. These conicals are built from 304 stainless steel and with the ability to hold up to 5 psi of pressure. More Beer conical fermenters are the standard by which other conical fermentors are measured and feature professional quality tri-clamp sanitary home brewing fittings that are welded in place for a lifetime of use and all the hardware is brewery quality. The More Beer rotating racking arm allows you to adjust where you are drawing beer from on the inside of the fermentor, a key feature when you have different amounts of trub from batch to batch. This is the same racking arm that I use on my SS Brew Tech stainless steel conical fermenters. The 3″ tri-clamp opening on top allows you to easily add hops, oak, fruit, or whatever. We have a great selection of options including let extensions, casters, CO2 pressure gauges, blow-off and thermowell packages. Coupon Description: MoreBeer.com currently has a coupon code that will get you a 14 Gallon Temperature Controlled Stainless Steel Conical Fermenter $1549. This is More Beer’s flagship stainless steel conical fermenter for home brewing. You can ferment 10 gallon batches of home brew beer in these beautiful stainless conical fermenters, and control the temperature of your fermenting beer to within 1 degree, any time of the year! The included Dual-Stage Controller will simultaneously control both the cooling unit and the 40-Watt heater. The cooling unit mounts to the outside of the cone with no internal contact with the beer. The cooling is extremely gentle on your yeast, changing wort temperatures at about a degree an hour. It can get to and hold your ale fermentation temperatures of 65-72F even in ambient temps of 100F.